Can you imagine living in a place where you couldn't choose your own religion? That's what life was like for William Penn in the 17th century. He lived in England where everyone was expected to follow the rules of King Charles II, which included attending the Anglican Church. 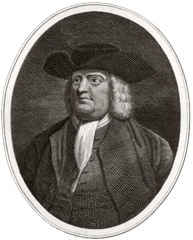 William Penn decided that he did not want to be an Anglican anymore, and thought that everyone should be equal. So, William Penn had a dream. He imagined a place where everyone could be free to choose how they lived and what they believed in. He would call this new place his Holy Experiment and named it Pennsylvania. Visit the pages above to learn more about this amazing man. Click here to watch a video about William Penn.